For information about this club, please contact Andrea Renner, or the YFC Office. Please read our newsletter! Below is an article from the Herald Mail published online on Sept. 26, 2018. BISFA students bow their heads in prayer Wednesday morning during the See You at the Pole event in downtown Hagerstown, organized by the school's Youth for Christ Club. The event is an annual nationwide gathering for Christian students. 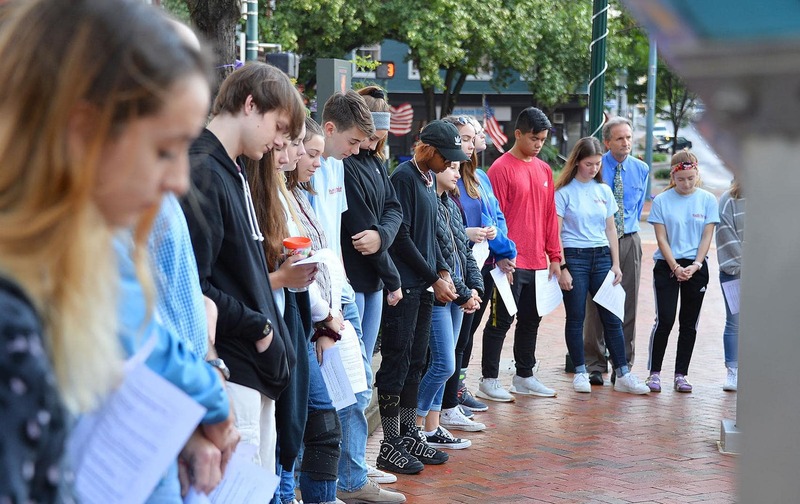 Around 25 students gathered in downtown Hagerstown Wednesday morning to pray for themselves, their school, the country and the world. For the ninth year in a row, members of the Barbara Ingram School for the Arts' Youth for Christ Club took part in See You at the Pole, an annual nationwide event for Christian students to gather around the flagpole at their school to pray, worship, sing and read scripture. They were also joined by a handful of parents and BISFA staff members. Senior Bethany Norris, who helped organize the gathering, said See You at the Pole was a good opportunity for the students to show they still believe in something and help "be the change they want to see in the world." Speaking to the crowd huddled around the three flagpoles in Public Square near BISFA's downtown campus, she thanked God for allowing them to be there and freely worship on the square. She also asked that their broken hearts be mended. "You love us despite all of our sins and mistakes," Bethany said. According to faculty advisor and science teacher Krystal Curtis, the theme for this year's See You at the Pole was "Broken," drawing from Ephesians 3:14 "For this reason I kneel before the Father." The students were encouraged to address the feelings of brokenness in their community and the nation as they went into smaller discussion groups between songs and group prayer. "We live in a broken world," senior Jared Shay, another event organizer, said. "How can we escape this brokenness?" Jared encouraged the groups to discuss anything they want to see change in their own lives, the school and the world, saying they were praying over the nation. Participants were also given small wooden crosses as reminders of the event.